Pro-Arab protesters congregate outside of 2017 AIPAC conference, chant anti-Israel slogans. 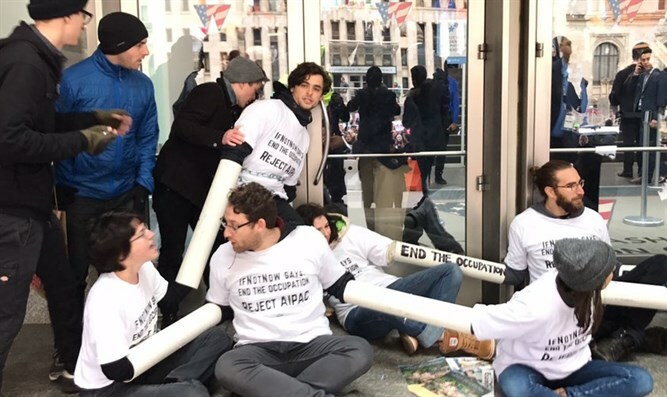 Anti-Israel protesters demonstrated outside the opening of the 2017 AIPAC conference in Washington DC Sunday. Some protesters formed a human chain in front of the entrance to the conference, while others gathered nearby chanting slogans. Counter demonstrations by pro-Israel groups were also held near the entrance of the conference, with several scuffles between pro and anti-Israel demonstrators reported. Tens of thousands of Jews and non-Jewish Israel supporters are expected to take part in the conference of the largest American pro-Israel lobby group, whose annual meetings have drawn Prime Ministers, presidents, and other world leaders. Former British Prime Minister Tony Blair spoke early on Sunday at the opening of the conference, along with Israeli Ambassador to the US Ron Dermer and President Paul Kagame of Rwanda. Other guest speakers slated to attend the conference are Vice President Mike Pence, Israeli Education Minister Naftali Bennett (Jewish Home), Opposition Leader Isaac Herzog (Zionist Union), as well as members of Congress. Prime Minister Binyamin Netanyahu will address the conference Monday via satellite.